Spending on data centre hardware and software globally increased by 17 per cent in 2018, with Dell EMC leading the market ahead of Cisco, Hewlett Packard Enterprise (HPE) and Huawei. According to new findings from Synergy Research Group, such investment was driven by “burgeoning demand” for public cloud services, alongside a need for “ever-richer” server configurations, which drove up enterprise server average selling prices (ASPs). Specifically, spending on public cloud infrastructure grew by 30 per cent, while spending on enterprise data centre infrastructure grew by 13 per cent. The latter was driven by 23 per cent growth in private cloud or cloud-enabled infrastructure, which helped to offset a "marginal decline" in traditional, non-cloud infrastructure, according to findings. "Cloud service revenues continue to grow by almost 50 per cent per year,” said John Dinsdale, chief analyst at Synergy Research Group. “Enterprise software-as-a-service [SaaS] revenues are growing by 30 per cent, search/social networking revenues are growing by almost 25 per cent and e-commerce revenues are growing by over 30 per cent. In terms of market share, Dinsdale said ODMs in aggregate account for the largest portion of the public cloud market, with Dell EMC ahead of Cisco, HPE and Huawei. Furthermore, the 2018 market leader in private cloud was Dell EMC, followed by Microsoft, HPE and Cisco - Dinsdale said the same four vendors led in the non-cloud data centre market, though with a different ranking. 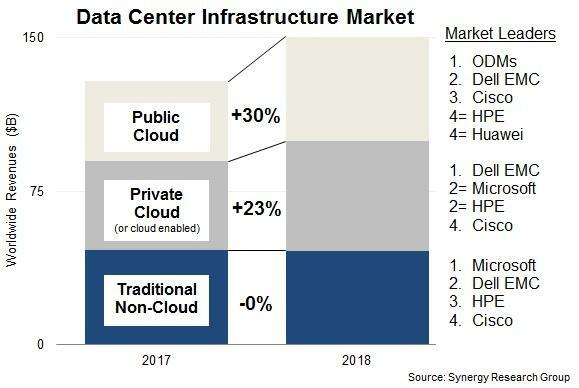 Delving deeper, Dinsdale said total data centre infrastructure equipment revenues, including both cloud and non-cloud, hardware and software, were US$150 billion in 2018, with public cloud infrastructure accounting for "well over" a third of the total. “Private cloud or cloud-enabled infrastructure accounted for a little over a third of the total,” Dinsdale added. 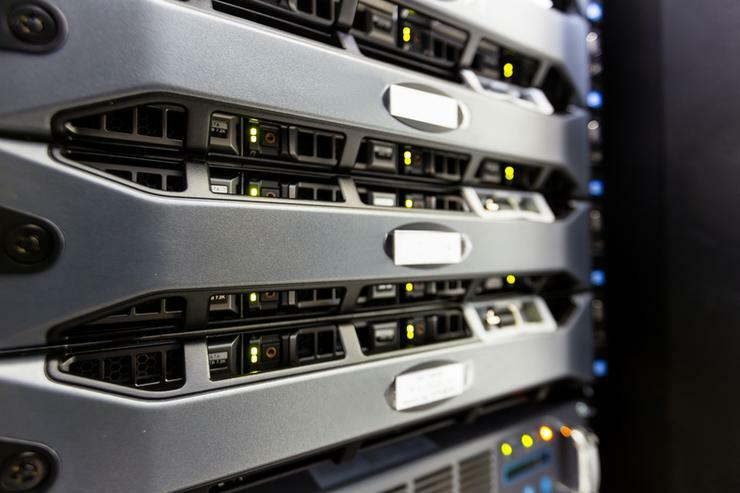 Meanwhile, servers, operating systems (OS), storage, networking and virtualisation software combined accounted for 96 per cent of the data centre infrastructure market, with the balance comprising network security and management software. By segment, Dell EMC is the leader in both server and storage revenues, while Cisco is dominant in the networking segment. “Microsoft features heavily in the rankings due to its position in server OS and virtualisation applications,” Dinsdale explained. Outside of the leading pack followed HPE, VMware, IBM, Huawei, Lenovo, Inspur and NetApp, with Inspur and Huawei achieving the strongest growth during the past 12 months. “We are also now seeing some reasonably strong growth in enterprise data centre infrastructure spending, with the main catalysts being more complex workloads, hybrid cloud requirements, increased server functionality and higher component costs,” Dinsdale added.